Calafell beach located near Barcelona and Port Aventura Park, in the middle of the Costa Dorada, is one of the most charming and familiar towns on the Catalan coastline that offers many opportunities for outdoor sports, cultural and leisure activities, enjoy nature and disconnect from the daily routine. Costa d’Or apartment hotel offers you self catering apartments to rent with swimming-pool just 50 m from the beach, in the center of Calafell, close to supermarkets, bars and restaurants. If you are looking for self catering apartment accommodation in Calafell well connected, as well as near the beach and in the center, Costa d’Or apartments will satisfy all your expectations. Calafell beach has an excellent communication with Barcelona (68 km), Barcelona airport (55 km) Reus airport (40 km), Port Aventura World (50 km) and with Tarragona (40 km). Costa d’Or apartment hotel offer you the opportunity to enjoy a family beach vacation at the seaside and visit Barcelona and its surroundings. There are different ways of arriving to Costa d’Or apartments, to enjoy a family beach vacation in Calafell, whether you have your own vehicle or not. Calafell is very easy to reach by car or from Reus or Barcelona airports. Bus L99: From Barcelona Airport Bus Station get the bus L99 direction Castelldefels and get off at Castelldefels „Avda. Constitució-Avda. Sta Maria”. It will be clearly signposted. 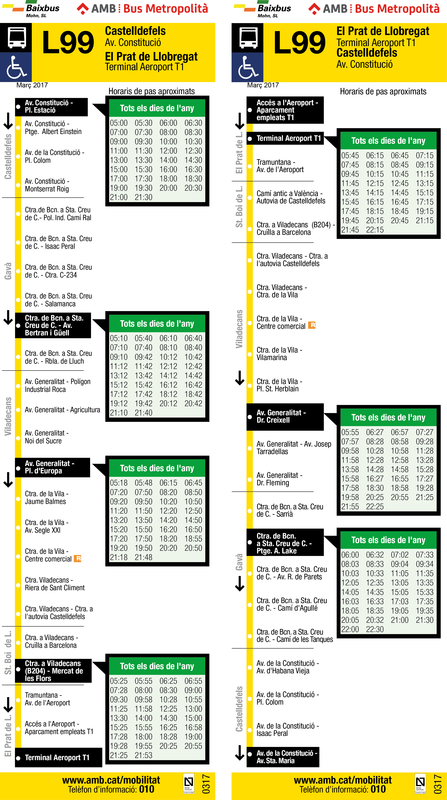 These buses depart from Barcelona Airport Terminal 1 every 30 mins approx (x:15 und x:45 h). It takes 25 minutes. Last bus from Barcelona airport at 22:15 hrs. The bus stop in Castelldefels is located just in front of Castelldefels train station and is called „Avda. Constitució-Avda. Sta. Maria”.